We’d love your help. Let us know what’s wrong with this preview of It Was Always You by S.L. Sterling. But when Parker - her college sweetheart - comes back around she’s immediately divided between trying again or protecting her damaged heart. Parker hasn't been able to get Tatum off his mind since the night he walked out of her life. Eight years of one n Fresh out of an abusive relationship, Tatum packs up and goes to live closer to her brother. Parker hasn't been able to get Tatum off his mind since the night he walked out of her life. Eight years of one night stands, along with sleepless nights, and the pain of losing her has virtually faded. But now she's moving back to town and all the emotions of the past come crashing in to drive him back to her. To ask other readers questions about It Was Always You, please sign up. 3.5 for this solid debut. The characters and the story are full of emotion. Most of it angst - which, if you're like me, is a dream. I love those true to life stories where nothing is easy and the characters don't always make good choices. This book delivers on all of that. Good first book from this author. I look forward to more. This was a beautiful second chance romance! I instantly fell in love with Tatum and Parker! This book gave me all kinds of emotions!! I laughed, I cried, I wanted to slam my kindle down!! I loved it!! 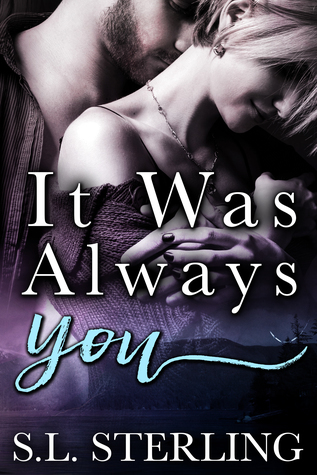 It Was Always You by author S.L. Sterling. This standalone second chance novel is an enjoyable and beautifully written story with likable characters and twists. I have consumed it in one go. Tatum is dating Parker, but they are at a crossroads in their relationship. Tatum after losing her parents couldn’t deal with a long-distance relationship. Tatum and Parker are sweet young people in love with each other, but Parker got job opportunity he could not pass, so he leaves their hometown to explore It Was Always You by author S.L. Sterling. This standalone second chance novel is an enjoyable and beautifully written story with likable characters and twists. I have consumed it in one go. Tatum is dating Parker, but they are at a crossroads in their relationship. Tatum after losing her parents couldn’t deal with a long-distance relationship. Tatum and Parker are sweet young people in love with each other, but Parker got job opportunity he could not pass, so he leaves their hometown to explore the presented career path. 8 years later Tatum is struggling with abusive boyfriend Dean and takes time to realize that this man is a cheating liar with a severe case of unhealthy possessiveness that is not promising anything good for her. Eventually, she gathers the courage to leave him. Then she does, she move away to live closer to her brother Elliott. Tatum soon realizes that Dean is not so keen to let her go, and is threatening Tatum with retaliation if she won’t listen. She is scared and ashamed to admit she was reduced to this woman who allows being treated this way. So Tatum suffered Dean’s verbal or physical abuse silently for ages until one day she catches him cheating and decides to move on. Apart from her beaten down self-esteem, she is also a very stubborn woman, who soon realizes that she must ask for help and protection from her brother and Parker. It is just not that easy to admit the truth. Elliott and Parker are partners at the police and childhood friends who have been in each other’s life forever. Parker never got over Tatum, so when she comes to live closer to her brother, he is afraid it will be too painful to be around her and tries to avoid the woman who is still able to ignite his blood. Their chemistry is a live wire, and they both realize fast that their feeling never went away. I devoured this book in one sitting! I really enjoyed this story, I thought it was well written. I liked Tatum and Parker. I would have liked to see them communicate more before jumping into bed together. I liked how protective Parker was towards Tatum. Even when they weren’t on the same page, he recognized something wasn’t quite right and went to check on her. I liked the brother/sister relationship that Tatum and Elliot. I loved how close they are. I did not like Dean! He was the opposite of Parker and it showed. That guy had some nerve with some of his actions! I really wanted to love this book since second chance romances are my favorite but unfortunately it fell flat for me. Tatum in my opinion was too selfish and stubborn for her own good; most of the bad things that occurred could have been avoided if she listened to her brother or best friend. Parker wasn’t what I was expecting for a cop since he basically follows Tatum around like a lost puppy. The two people I actually liked in the book were Tatum’s best friend, Jen and Tatum’s brother, Elliott. It’s really hard to care about a character when they have no sense of self preservation. The story was interesting in the beginning but towards middle/end it started to get a little boring and by the end I was skimming through the pages. You never get a real sense of their relationship and the flashbacks between past and present events were confusing since you couldn't tell when we were in past or present. First I must say the synopsis is a little misleading since Parker didn’t leave Tatum behind, she basically pushed him away and refused to talk to him. Dean was a total psycho and Tatum was blind where he was concerned. She made everyone believe that he wasn’t that bad of a guy but according to her Dean’s been physically and emotionally abusing her from the start. Then when she finds out Dean is cheating, she tries to break up with him and he slaps her, then she not only forgives him but sleeps with him; however, she dumps him again when she finds out he’s still seeing the other woman. Then when she finally tells her brother the truth because she wanted no secrets between them, she still kept another secret from him. Parker was so whipped on Tatum, that girl could have kicked him in the cojones and he would have loved it. He blamed himself for their break up but Tatum is the one that refused to try anything to keep them together. Basically, the whole story is Tatum being terrorized by her psycho lawyer ex-boyfriend and completely ignoring the safety advice from her loved ones who happened to be police officers. Then she needs help when Dean keeps finding and attacking her. This book is raw and emotional. Tatum goes through too many tragedies and changes in life to handle a long distance relationship with Parker. Since then, Parker has always felt that Tatum was the one that got away. After years of each of them trying to move on Tatum is brought back into his life, albeit with some demons hot on her tail. This story started of very slow and I was a bit disappointed. But suddenly it took me by surprise. It all fell into place. It became an amazing read with great storyline and plot. It is slow paced and suits the characters and how they develop. A story about letting the past go and get your HEA. Take the second chance. A strong and independent heroin but also very stubborn and at times too stubborn which annoyed me. Characters are likeable and well described. They have great chemistry and passion This story started of very slow and I was a bit disappointed. But suddenly it took me by surprise. It all fell into place. It became an amazing read with great storyline and plot. It is slow paced and suits the characters and how they develop. A story about letting the past go and get your HEA. Take the second chance. A strong and independent heroin but also very stubborn and at times too stubborn which annoyed me. Characters are likeable and well described. They have great chemistry and passion. There is love, heartbreak, hurt and emotional ups and downs in this story. I like it is written in dual POV, which gives the reader both the thoughts and feelings of the main characters. The twists makes you just want to read more. At times it seems to me that I love to one degree or another just about every book I read and that is odd. But then I come across a book like this and I realize I don’t love every book I read. I didn’t love this book. I didn’t even like it. Though the hero was on the bland side, the heroine drove me bonkers. Tatum, our heroine, is with a real douche. Though we learn that it’s clearly evident what a jerk he is and even Tatum experiences it, she stays with him until she’s had enough. They are suppo At times it seems to me that I love to one degree or another just about every book I read and that is odd. But then I come across a book like this and I realize I don’t love every book I read. I didn’t love this book. I didn’t even like it. Though the hero was on the bland side, the heroine drove me bonkers. Tatum, our heroine, is with a real douche. Though we learn that it’s clearly evident what a jerk he is and even Tatum experiences it, she stays with him until she’s had enough. They are supposed to be celebrating something or other overnight in a hotel and rather than spend the time with her, her boyfriend “claims” to be in a business meeting and it isn’t until the next morning when she spies him kissing another woman, she realizes that’s it and the relationship is over. It wasn’t the times he became physically abusive of her, nope that didn’t do it. She heads out to visit with her brother on the other coast for a while. He’s a cop who happens to work with her childhood sweetheart. They were destined to be together but her parents died and very shortly after he was offered a position working for a police department very far away. He wants to keep in contact and work a long distance relationship and they try for a while but then for some reason, and who knows what really, she just stops corresponding with him. She still loves him though and we finds out he, or Parker is his name, has been carrying the torch for her all these years. They get back together, she almost leaves, her ex-boyfriend comes back into the picture, danger, danger, danger, danger solved and they live happily ever after. Blah, blah, blah. Except…. Tatum is an idiot. Do you ever watch those scary movies and the people are headed downstairs and you’re thinking ‘don’t go down there, don’t go down there’ and they do and because they are stupid, things go very bad? Well that’s Tatum. She stays with this jerk even though she is close to her brother and the jerk wants her to cut all ties with her brother, the only family she has left. Hello – a guy like this? Warning bells. And when she moves to be with her brother and her ex starts to terrorize her, does she tell her brother the cop???? Of course she doesn’t because she’s an idiot and to tell a family member SHE IS BEING STALKED BY AN ABUSER would be a sensible thing to do. Then she’s offered a job back in New York and she takes it. Even though she and Parker are now back together and it’s the same company that dropped her with no warning, she ready to come back. Does she say anything to Parker, the love of her life she is getting a chance with? She is getting to spend time now with her brother, her only family left. Idiot. She’s all set to leave something good including love, for what? I don’t know. I don't take the same idiot pills she clearly does. And I’d probably have something to say about Parker except that even though it was just a short time ago that I read this book, I can’t remember him really at all. And that’s never a good sign. A hero I can’t remember, a heroine I couldn’t stand and an over the top villain all make for a book that sadly I can’t recommend. And while I usually don't question high grades on books I don't 'get', knowing one person's junk is another person's treasure, in this case I'm truly puzzled by the high grades there are here. I don't get it, I really don't get it. This is the first book by SL Sterling that I have picked up. I was not sure what to expect about the authors ability to write a well development and likable story with good characters. I was pleasantly surprised and really enjoyed this story and the development of both the characters and plot. I really liked the story and it was definitely a page turner. The story starts off with a prologue that begins eight years earlier. Tatum and her brother Elliot have just lost their parents in an accident. This is the first book by SL Sterling that I have picked up. I was not sure what to expect about the authors ability to write a well development and likable story with good characters. I was pleasantly surprised and really enjoyed this story and the development of both the characters and plot. I really liked the story and it was definitely a page turner. The story starts off with a prologue that begins eight years earlier. Tatum and her brother Elliot have just lost their parents in an accident. Tatum is dating Parker but they are at a crossroads in their relationship. He has a job opportunity he cannot pass over and wants her to go with him but understands she has face a lot of changes lately. He loves her and wants to keep their relationship together but things don't workout. Skip ahead eight years she works for a newspaper, is dating Dean and her brother has moved and started working with Parker. You need to read the story to see how things develop. I liked Tatum, Elliot, Parker and Jen. All really likable characters. I did not think Tatum was a very strong female character but I think she is what you would expect in this story. Jen was definitely a strong female character. Elliot I had to sometimes question his loyalty to his sister. I really liked Parker a lot! There was a lot of chemistry and connection between Parker and Tatum. I did like this second chance at love it was a little romance, drama, suspense and excitement plus a crazy man. I loved the ending!! I look forward to reading more by SL Sterling. Parker and Tatum were the perfect couple and loved each other deeply. When a job transfers Parker hours away and Tatum can't move with him, she ends the relationship instead of trying the long distance thing. Parker was resistant to open his heart again so he has one night stands and never lets anyone else get close. Tatum tries to move on but doesn't realize until it's too late that the great guy she thought she knew was really the devil in disguise. Tatum manages to escape him but her heart an Parker and Tatum were the perfect couple and loved each other deeply. When a job transfers Parker hours away and Tatum can't move with him, she ends the relationship instead of trying the long distance thing. Parker was resistant to open his heart again so he has one night stands and never lets anyone else get close. Tatum tries to move on but doesn't realize until it's too late that the great guy she thought she knew was really the devil in disguise. Tatum manages to escape him but her heart and body are bruised from the abuse she endured. Tatum flees to the town where her brother lives which is also where Parker moved to. It may be 8 years later, but those old feelings are brought back to life hard and fast when she and Parker see each other again. Will Tatum and Parker get a second chance at a HEA? This was a good read. It started off a little slow but built up quickly after a few chapters and kept my interest until the end. Parker and Tatum are great together and I loved how protective he was of her. Tatum's brother and her best friend were fantastic secondary characters. This is S.L. Sterling's debut novel and I think she did a great job with her writing and keeping the momentum going once the story picked up. I'll definitely check out her future works. Eight years ago Tatum Bancroft was dating Parker Harrison but when he got a job offer in another town they split up with Tatum not wanting to deal with a long distance relationship. Now she finds herself desperate to leave an abusive relationship with her cheating boyfriend, Dean. Tatum heads to her brother Elliot’s for a chance to start over only his partner in the police force is Parker. Tatum’s only problem is trying to discover whether she still has feelings for Parker and of course dealing w Eight years ago Tatum Bancroft was dating Parker Harrison but when he got a job offer in another town they split up with Tatum not wanting to deal with a long distance relationship. Now she finds herself desperate to leave an abusive relationship with her cheating boyfriend, Dean. Tatum heads to her brother Elliot’s for a chance to start over only his partner in the police force is Parker. Tatum’s only problem is trying to discover whether she still has feelings for Parker and of course dealing with the threatening messages that Dean is sending her. Can Tatum handle Dean on her own or will she need help from Elliott and Parker? Will she finally find the love she has always wanted? This book had quite a few twists and turns that left me scared and wondering what was going to happen next. My heart broke for Tatum and everything that she went through with Dean and knowing she had to look out for herself above all else. Yet she definitely had a lot to fear with how Dean would take her leaving, yet I really didn’t expect the reaction to a certain extent. I loved both Elliott and Parker and how protective they were of Tatum. I was mad that Tatum didn’t tell them both everything right from the start. I loved all of the twists and turns with Dean and I was so happy for how things turned out. I was pulled right into this story. The story has pain, second chances, suspense, and sweet love. This is Tatum and Parker’s story. After finally getting out of an abusive relationship Tatum moves closer to her brother to start over fresh. Being back with her brother brings different memories. When she sees Parker a man that left her and broken her years ago she does not know if she wants to give him another shot. Parker has regretted leaving Tatum for the last eight years and when he finds out that she is coming back to town he knows he must get her back. It will not be easy. She has not had an easy time since they were together. Just when she tries to move on with her life and give Parker another chance her ex comes back determined to have her back. Will she be able to fight for what she wants, or will the ex make sure he destroys not only her but Parker also? Will Tatum finally get the man she deserves, or will she lose everything? Parker and Tatum were separated in their relationship due to Parker’s new job for a police force that was long distance from their current living space. Eight years later, life decides to throw a curveball at both Parker and Tatum, and bring them back into each other’s lives. Tatum had moved on to someone else, but found that the new relationship wasn’t what she was hoping it would be. She realizes her current boyfriend is cheating on her, and now wants nothing to do with him. Tatum moves to be next to her brother, Elliott, not realizing that he is also working with Parker again on the same police force. Now suddenly, Tatum’s world is rocked to the core when her past suddenly becomes her present. "I received the ARC in exchange for a honest review. It Was Always You was a GREAT read! I enjoyed the story of Tatum and Parker! I loved the reconnect/second chance love story. In the prologue, Tatum and Parker part ways after college, because they both have separate futures. Tatum gets into a relationship that goes south, and she decides she is better off moving by her brother, who happens to be best friends with Parker. Their friendship slowly rebuilds. There is drama, angst, love, hatred, and heartbreak throughout this book. I really loved the s It Was Always You was a GREAT read! I enjoyed the story of Tatum and Parker! I loved the reconnect/second chance love story. Their friendship slowly rebuilds. There is drama, angst, love, hatred, and heartbreak throughout this book. I really loved the storyline in last part of the book. The author, S.L. Sterling did a wonderful job blending all the situations together in this book! The characters are great (and sometimes frustrating, LOL) I didn't care for Tatum not being truthful in parts...but, overall...a recommended read! I loved both Elliott and Parker and how protective they were of Tatum. I was mad that Tatum didn’t tell them both everything This book had quite a few twists and turns that left me scared and wondering what was going to happen next. The ending had me a little worried but things worked out how they should! This book is an amazing second chance romance! It has a great storyline and wonderful characters! It hooked me from the start and wouldn’t let me go until I finished! Tatum and Parker were together until a job tore them apart. Years latter Tatum moves to the town her brother lives. Parker lives there too! Tatum and Parker never stoped loving each other and they try again. Both guarding their hearts from being broken again. This story has love, heartbreak, passion, emotional ups and dow Amazing Book! This story has love, heartbreak, passion, emotional ups and downs and some twists that keep you wondering what happens next! I can’t wait to read SL Sterlings next book! I received the ARC in exchange for a honest review. I was sucked into this story immediately! I didn’t think I was going to enjoy it as much as I did. I loved the characters and could definitely relate to Parker. I’ve never once related to a guy before but this time I did. The reason I gave this four stars was because for me, the love scenes seemed a bit lacking to me. The heat wasn’t all there. I didn’t feel the emotions like I should as it was written rather point blank. Like he did this, she d I received the ARC in exchange for a honest review. I was hooked by the first page. Tatum is one that you will stay with you. She's been through alot and her and Parker deserve this 2nd chance. The path isn't one for the faint of heart. You will go through the emotional ringer. My first book from S.L. and I'm craving more. Writing as though you are witnessing it first hand. Characters that command your attention and give their story that real deal feel. I am definitely going to recommend "IT WAS ALWAYS YOU" to my reading group. Don't miss this amaz I was hooked by the first page. Tatum is one that you will stay with you. She's been through alot and her and Parker deserve this 2nd chance. This is the first book by this author that I've read and i was just blown away, a fantastic story which i just couldn't put down till I'd finished it. This is a second chance romance story you will love. You will fall in love with the characters you read. The characters have a fantastic connection from the start. This is an emotional story, so you may need the tissues at the ready. I can't wait to read more from this author in the future. I voluntarily reviewed an advance reade This is the first book by this author that I've read and i was just blown away, a fantastic story which i just couldn't put down till I'd finished it. This is a second chance romance story you will love. You will fall in love with the characters you read. The characters have a fantastic connection from the start. This is an emotional story, so you may need the tissues at the ready. I can't wait to read more from this author in the future. This is my first book by S.L. Sterling and it won't be my last ..
⚠My only warning is it has a couple of very mild triggers .... if that won't bother u or u can move past them it's a absolutely wonderful story ... This is my first book by S.L. Sterling and it won't be my last .. I teeter between 4.5 and 5. I would have liked a little more character development but I loved the characters and the book is well written. Me being nosey wanted there to be a story with Elliot and Jen to be another book but also glad there is not. If it would have been to prior commitment I would have devoured this book in one sitting. As it was I stayed up too late as it was to continue on reading. I absolutely loved this book and was honored to have been able to receive an arc to read and review. It was such a phenomenal read and had amazing characters as well as an amazing story line. I just couldn't get enough of it and once I started reading it I couldn't put it down. I recommend that you read it. If you are looking for a sweet second chance romance then this book is for you. Parker and Tatum were college sweethearts that split, because Parker was offered a job in another state. Years later they meet back up when Tatum moved to the same town Parker lives in so she could be closer to her brother. Her crazy ex causes some issues along the way. The only reason I have 4 stars instead of 5 is I was hoping for something different for her ex. I loved the story of Parker and Tatum, their love for one another never deminished over the years they spent apart. The stubbornness of Tatum was frustrating at times for me, but as an independent woman I could understand it. I like the secondary characters as well and wished they had a little more to their story, but at the same time the book wasn’t about them! I would like to see a second book with Jen and Elliott. An avid reader all her life, S.L. Sterling dreamt of becoming an author. She decided to give writing a try after one of her favorite authors launched a course on how to write your novel. This course gave her the push she needed to put p S.L. Sterling was born and raised in southern Ontario. She now lives in Northern Ontario Canada and is married to her best friend and soul mate and their two dogs.